On October 25, Peter LaBarbera hosted Bishop Jackson on his radio show where they both indulged in talking about LGBT people in a dazzling display of venom that showcased the depths of their collective contempt and ignorance regarding gay men and lesbians. It was a race to the bottom. In the midst of this one hour diatribe, Bishop Jackson was incensed that George Washington Carver (1864-1943), the famous African American inventor and botanist, could be considered gay. (This came to his attention because of October being LGBT History Month). Bishop informed LaBarbera and his audience that it was “a lie! Sad that they would slander that man that way.” In the interview Jackson tried to see how many times he could break the 9th Commandment (thou shalt not bear false witness against thy neighbor) as he espoused the view that gay men and lesbians have “perverted minds” and are “very sick people psychologically, mentally and emotionally”. Jackson derisively dismissed that notion that G.W. Carver could be gay because Carver was good and gay is bad in Bishop Jackson’s world. The truth is that neither Jackson, nor anyone else has any proof that Carver was heterosexual. But we do have knowledge that Carver never married and rebuffed friends’ attempts to set him up with women. Carver lived with Austin Wingate Curtis, Jr., in a life partnership, and left all of his assets to Curtis. “Carver never married and rebuffed the match-making efforts of his friends. From 1935 on, however, he enjoyed the companionship of young Austin Curtis Jr., a Cornell graduate in chemistry. Mr. Curtis accompanied Carver everywhere, providing comfort, assistance and protection, making it possible for Carver to continue his work. Carver would gently tuck his hand into Curtis’s arm when the two set off to check experiments. Upon Carver’s death in 1943, his assets went to Curtis, his devoted companion. In addition, I had the privilege of holding in my hands a letter written by the hand of George Washington Carver that led me to believe that he was indeed a gay man. 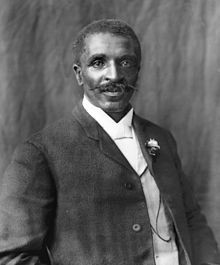 In Bishop Jackson’s world the beautiful genius of George Washington Carver could not stem from a gay heart. In the real world, it did. Sylvia Rhue is a writer, activist, filmmaker and producer. She is working on a one-woman comedy show called “CAKE: You Ain’t Gettin' None,” which will be filmed and performed in Santa Monica, Calif. She is the former Director of Research and Academic Initiatives and former Director of Religious Affairs with the National Black Justice Coalition located in Washington, D.C.